Here are four different coordinating diaper cakes that are AMAZING accents for a darling jungle baby shower! 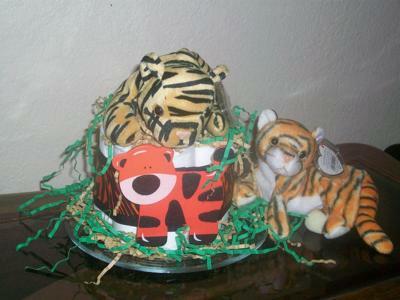 Each diaper cake features a different animal and they all are simply fabulous! In addition to each of these cute cakes, Tambra has submitted pictures and descriptions for the ENTIRE baby shower! Go here to see the Jungle Baby Shower she threw for her daughter-in-law. Tambra is one of our many incredible readers who has shared her ideas with us to help other hostesses who need some inspiration. We LOVE our readers for all the thought and time they put into sharing their ideas. Such incredible people! Thanks for your awesome ideas Tambra! If you have pictures of your diaper cake or your baby shower to share, send them to us right here. We'd love to post them for thousands of readers to see! This cake was built around a bottle of champagne for the core. The top layer includes travel-size Johnson & Johnson's Baby Powder, Lotion, Shampoo, and Wash as well as a baby thermometer, brush & comb set and a travel baby spoons set w/case. The Large Giraffe is the Gentle Sounds Giraffe that plays 5 soothing sounds including a mother's heartbeat heard from the womb. The shower theme was safari animals with an emphasis on giraffes. 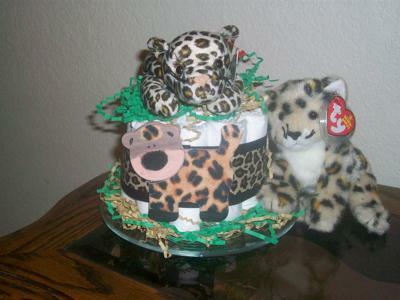 To flank the three-tier giraffe cake I made two one-tier cakes and decorated them in Leopard and Tiger. 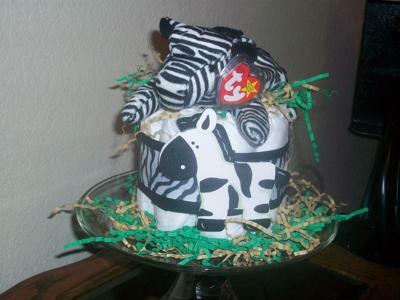 For the dessert table between 2 cupcake towers I made a zebra diaper cake and put it on a small display plate. All other stuffed animals are Ty Beanie Babies. 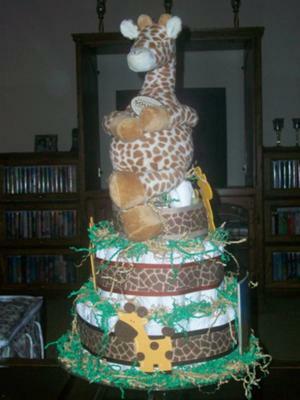 Amazing post of a Giraffe Cake. What a great article. Thanks for sharing this information, exactly what I was looking for! It's a great Gentle Sounds Giraffe Cake. I'm very happy to find this website. I like to say thanks for this great effort. Thanks for such post and please keep it up! I love your cake! Where did you find the ribbon in the giraffe and zebra patterns. I found the wooden animals on the front of the cake at both Hobby Lobby and Michaels prepainted. I used them to cover the seam of the ribbon. The large Giraffe is a Gentle Giraffe which has @5 sounds of a mother's womb, and other soothing sounds.